Like the French, I’m told, I think about lunch just after breakfast and dinner just after lunch. 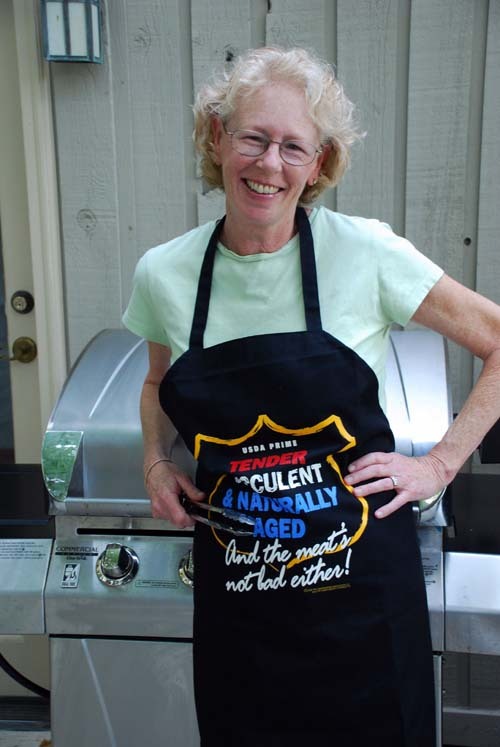 I read cookbooks like novels and even got a chance to write one, The HandyMom’s Guide to Grilling (Cool Springs Press). In my various incarnations, I’ve been a food writer, restaurant critic, broadcaster, drone-like manager and, now, a nonprofit CEO. Actually, that sounds a little grand. I run a nonprofit that provides basic household necessities to other nonprofits and their clients. I get to write grants, schmooze funders and work in a warehouse full of cool stuff that I get to give away. It’s a good life. What’s for lunch? King Daddy is man of the house, although he doesn’t get to come near the grill. He’s willing to try anything and has graciously not said a dang word about the three great culinary mistakes I’ve made in my cooking career. We just won’t go into the fish Jello. Mark and I are sharers of food and when we eat out we shamelessly stick a fork in each other’s plate to see who ordered the best thing. He usually wins. Noah is our son and a guy who’s quickly becoming an adventurous cook. He makes his own hollandaise and he’s also just Southern enough that he understands the true value of cream of mushroom soup. He love sushi – the really daunting kind like a roll with giant fish eggs on it. Noah is currently living in Vienna, Austria, working at the Vienna Center for Disarmament and Non Proliferation, and is fluent in Russian. I was hoping that he secured a job with some Russian vodka manufacturer so Mum can get free hootch. But saving the world from atomic bomb disaster will have to do. Bunny is Noah’s grandmother. If you notice that she looks younger than me, she is. It’s a long story, but we don’t have a family tree. We have a kudzu vine. Bunny is a Southern cook in the most traditional sense. She is queen of the casserole, a devotee of that classic combination of blue box mac and cheese with hotdogs, and author of the best dang dip you will ever eat – ham dip with Fritos Scoops. She also shamelessly dotes on her grandchildren, nieces and nephews and thinks nothing of dropping more than $300 at the Costco just to keep them in provisions. Let me just say from experience that the wording on the apron (above) is absolutely accurate. Wowza! I stumbled upon your blog when I was googling Sequatchie Cove Farm (we visited over the weekend). We live in Bridgeport and I enjoyed reading about the things we hold dear to our hearts locally. So nice to meet you today! I couldn’t manage to attach a picture to this blog reply, so I sent it to you through your CRC email address. (@crcnashville.org) I hope it makes it to you. I love your website! The Stuffed poblano peppers were my favorite thing I’ve tried form what you have shared. Great pictures too! Thanks! I love those peppers, too. Just heard of a new Iowa-potluck dessert that merits exploration (and exploiting). I’m thinking of cherry with graham cracker crust and a chocolate cake… Of course, a quiche and biscuit mix, or peach and vanilla gets interesting..
My friend Teresa McGee, former head of HR for the Maryknoll brothers and fathers, and a devoted Iowan passed this on. 1. Take a pie (of course, it’s best to think of taste combinations first). 2. Invert into a rectangular cake pan (yes, upside down). 3. Surround with the cake mix of your choice. 4. Bake per cake mix directions. Love your blogspot, love your take on life and cooking and food and everything in general, I live in the pacific northwest we have 10-11 months of pretty chilly weather and not too much sunshine..Your columns really brighten up the months of dreariness..happy holidays, may god continue to bless you and your kin..I am trying your recipes to keep warm, it is suppose to snow soon in the mountains, brrr…your recipes are a great relief to that kind of weather..mary jane fondly…..
Just stumbled upon your delightful blog I am working on a new project on the history of the South as told through the Southern table. It will be a story of plain people and of the multicultural and multiethnic roots of Southern food and Southern identity. Might be fun to chat sometime! In the meanwhile, I will peruse your archives. Jamie Ross, how nice to see you are a fan of this blog. It’s one of my favorites. Somehow it always makes me feel good and I love Catherine’s take on everything. It helps too that she heads up an agency in Nashville that helps so many. Best to you. Found your blog when I was looking for a picture of a tomato sandwich. There is no cuisine quite so glorious as that found here in Dixie. Found your Blog looking for Southern Funeral Foods. It’s really great. I am also Episcopalian and understand the silver, glass, etc. for receptions so well. You’re too cute! Just love everything I’ve read so far. Oh, and The Husband Unit’s post was adorable.. Someone sent me the link to your blog after you posted about the baptism and I started reading past posts and I am addicted! This is just wonderful and I will be busy this fall trying out all the recipes! Love your blog! As a college culinary student, I really enjoy your creative takes on thing’s, and your witty humor is an added bonus! I enjoy reading your posts, it’s a nice break from the hustle and bustle of a busy kitchen. Keep it up! It all looks amazing. Thanks!I’m sure you could teach me a thing or two! I’m the world’s least picky eater. I love everything, even liver! I use Yahoo and have tried opening your emails on both FIREFOX and IE…they will not open. Catherine, I am a P.E.O. in Chapter AU in Augusta GA. I do the monthly newsetter Daisy notes and want to include your website and logo in the DN, if you don’t mind sharing with other P.E.O. sisters. Could you tell me which chapter you are in? I read it in an older blog but did not save the blog. I want the chapter to see what P.E.O. s can do! That would be great! I’m in Chapter AG in Franklin, TN. Would love to show it to my chapter. Thanks for thinking of me. I talked about your blog today on my new regular post, Blogs I Love. Hope you have a wonderful day! Thanks for all the yummy recipes! Thanks so much!! I’m glad you enjoy the blog. Catherine…I use so many of your recipes! I’m trying to print the “northern” dressing…thinking about thanksgiving all ready. Love you, Susan.